Don't be scared of this UFO...just get it done! Look up to the skies! What do you see? Is it a bird? A plane? No! It's a UFO! Run for your lives! Wait a second. A cross stitch UFO is a little different from little men from outer space. One common term is UFO. The use of this term in cross stitch lingo has nothing to do with little green critters. Instead, the term refers to an Unfinished Object. Some stitchers have a terrible habit of starting more projects than they finish. They have good intentions but they just can't seem to finish a project. Some UFO's are destined to float around unfinished for an eternity. Others are eventually completed, even if it is by another stitcher. Many people will start the project and then offer it up to others to finish it up. One great way to jump-start a child's stitching journey is to have them complete a small design that has already been started. This is a wonderful idea to create a family heirloom. One elderly family member can start the project and then pass it down from generation to generation; each person taking on a new chapter in an old cross stitch. It tugs at their inner being. They are the type that their projects have a purpose and they have to be done. On some crafty projects, most of us want to have the craft done. Other times it is best to have it drawn out, like cross stitch projects. Cross stitch is very therapeutic. 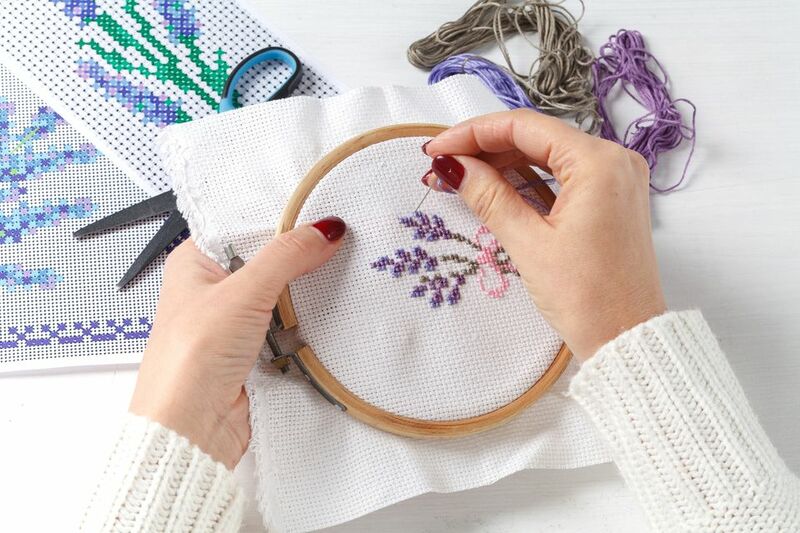 It is a process and yes, you want to have it done, but it is more about the experience and the feelings you have while cross stitching and less about the end project (unless you are making a present and have a deadline) Most people will have at least two or three projects going at one time. Needlepointers.com has several articles about UFO's and how to organize them and not let them take over your life. Organizing your projects is a must for multiple projects going on at one time. It is the best way to keep all of your floss and fabric in one place. It is also best to keep the pattern with the project. If all things are in one place you can pick up the project and continue at any time. Is there anything Mary Corbett can't do? She is so amazing, her tutorials are brilliant and easy to understand and yes...just like us, she has UFO's. She confesses to having unfinished objects but she also knows how to solve the problem and gives a wonderful explanation on why they should be finished and what they mean to us. Read about her adventures with UFO's and how she solved the problem. She also offers excellent tips and patterns for needlework. She is very personable and if you need to reach out to her, she will definitely answer. You can set time limits for your work, not start a new project or even better, start a stitch circle. It is a fun way to have everyone bring their unfinished objects, have snacks, and each person can work on not only their projects but others that have been brought. If you are not tied to one project, offer it up to a friend or to your sewing circle and let the UFO have a new home. Isn't it exciting that you have others give their love to your project and you get to scratch off one more project? It is a fun way to meet new people and work on other projects. Start new projects each season and once the season is over, put it down and work on another seasonal theme pattern. It is a fun way to keep your stitching fresh and you won't get bored. Whatever you choose for your UFO's, you will definitely get to them....one day. Reading a cross stitch chart: What are two symbols in one square?